Sea kayak Rolling courses – well the waters warm and the sun is shining so why not! 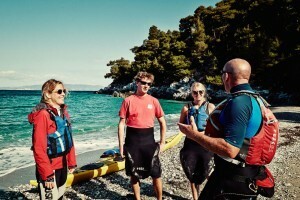 Our sea kayak courses in Greece include BCU Paddlepower. These courses consist of a series of progressive levels. Certificates are awarded by the British Canoe Union (BCU) and aimed at younger paddlers. The levels cover all aspects of paddlesport. From personal skills and boat handling to looking after yourself and your friends and are a great way for under 16’s to get into paddlesport. The Paddlepower program is split into 5 progressive courses consisting of a number of levels. We offer the first 3 courses, levels 1 – 9. It is possible to work through some or all of these levels while here on holiday. Your child will receive a progress card that will be filled in by the coach after each session, once the card is complete simply send it off to the BCU for their certificate. Don’t worry if they do not manage it to complete the whole card while your here. Your child can take their progress card to their local kayak club and continue when they get home. – Level 1 This is a taster session, the certificate will be awarded by the coach at the end of the session. – Levels 2 – 5 Progressive levels covering a wide variety of subjects, equivalent to the 1 star adult award, time to complete 6-8 hrs. – Levels 6 – 9 These levels are equivalent to the 2 star adult award, time to complete 15-20 hrs. Why not join us in Greece where the water is warm and clear, no need for dry suits! The area around Skopelos provides perfect locations and conditions for you to improve your sea kayaking skills. The BCU’s star awards sea kayak courses are aimed at over 16’s with no upper age limit. These awards start with 1 star and go through to 5 star. 1 and 2 Star are general awards that require a wide selection of different boats, sea kayaks, sit on tops, open canoes and whitewater kayaks. We only have sea kayaks so at this time are not able to offer these awards. The 3 star courses are discipline specific. We offer the 3 star sea kayak award at our Skopelos base in Greece. You can have as many days of sea kayak coaching as you wish to prepare you for your assessment, or you can go straight for assessment if you feel ready. At 3 star level you are expected to have the skills to be a useful member of a small group, these include personal paddling skills, carrying out rescues and rescuing yourself in the event of a capsize and basic navigation. The 4 star sea kayak courses are aimed at those wishing to become sea kayak leaders. This leadership award is split into an official minimum two day training program followed by a two day assessment. 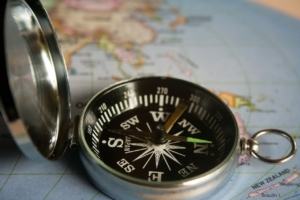 The coastal navigation and tidal planning qualification is a prerequisite for your training. See below for details on this course. Prior to your assessment you will also need a 2 day BCU certified first aid qualification. At this time we offer the 4 star training and the coastal navigation and tidal planning and the 2 day aquatic first aid. We do organize the 4 star assessment which usually takes place in Anglesey, North Wales in November. Contact us if you would like more details. We do not offer any part of the 5 star leadership sea kayak courses. This award requires advanced tidal conditions for all parts, we do not have these conditions in the Mediterranean. This BCU first aid course runs over 2 days and is a pre requisite for 4 and 5 star assessment and coaching awards. Weighted towards water related incidents this first aid course is a must for anyone working in the kayak world. Once completed the certificate is valid for 3 years. This BCU sea kayak course is a pre requisite for the 4 star training. Learn how to plan your trip, navigate and check the weather and tides. Ideal for coastal journeys and short crossings. What better place to learn this skill than in Greece! The water’s warm and crystal clear, the sun’s shining, beautiful beaches to relax on and traditional tavernas for home cooked food with friends. Whether your starting from scratch or you are a rolling god that occasionally has problems! Our sea kayak courses aimed at rolling are fun and anyone can have a go. We find the best way to learn is to break down the sessions into small bite size chunks. Then we spread the coaching throughout the day. After all there is only so much water you can fit in your nose! We do provide nose clips by the way!! We can either set up a rolling course designed for you or you can join one of our day trips and have a go at several points through the trip. What ever option you feel is best for your learning style we can accommodate it, after all the is Greece, where everything is easy going and laid back! Whether you’ve been kayaking for ever or this is your first go we can offer progressive sea kayak courses tailored to your needs. We can assess your abilities and make adjustments as necessary. If you have particular areas that you feel are weak we will concentrate on those. Very often in the summer we can find more dynamic areas around Skopelos. This is perfect for progressive coaching. We have sea kayaks designed for expeditions, maneuvering and surfing. Our paddles also come with different blade shapes and lengths. You can try as many different combinations as you want to find which works best for you. For more information about our courses in Greece contact us.